Councillor Brian Topping at the former Clydesdale bank building in Fraserburgh. The sale of former bank buildings could provide the chance to “breathe life” back into north-east high streets. Despite campaigns to save rural bank branches from being axed, several shut in 2017, including the Fraserburgh Clydesdale, followed by further closures in 2018, including the Turriff and Banff Royal Bank of Scotland. Feelings ran high among campaigners when branches shut, reflecting fears the vacant properties would have a corrosive effect on the the affected retail communities. But now it is hoped the outcome from the closures could be transformed into positives with two of the RBS branches sold and the Clydesdale being put onto the market – all offering the chance for new developments . Shepherd Chartered Surveyors listed the former Fraserburgh Clydesdale bank, at the junction between Broad Street and Mid Street, on the market as a 5,262-square foot development opportunity. 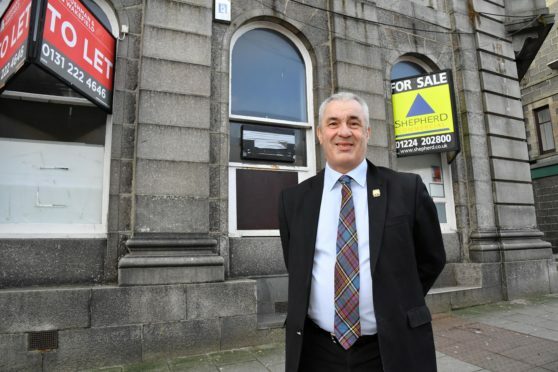 Chairman of the Fraserburgh Regeneration Project, Brian Topping said: “I’m delighted this is now on the market as it has been empty for years. “If you have one empty and then another, then they fall into deterioration and especially now, when times are changing and online shopping is increasing, we need to do what we can to help the high streets. “Every little thing helps local shops and buyers looking for opportunities really contribute to this and breathe life into town centres. Meanwhile, the former RBS premises on Main Street, Turriff, could be about to be converted into a gin bar. SNP councillor Alastair Forsyth said: “Regardless of what it actually becomes, I will be absolutely delighted. It is understood the former RBS on High Street, Banff, has been sold to a property investment company. Independent Banff councillor John Cox said he saw the signs change but heard nothing about the sale. An RBS spokeswoman confirmed the Turriff and Banff former bank buildings were sold on December 17 and 21 respectively.